U.S. Envoy: 'We're Taking Out' About 1 ISIS Leader Every 3 Days NPR's Kelly McEvers interviews Brett McGurk, special presidential envoy for the Global Coalition to Counter ISIL, about the fight against ISIS in the wake of the Istanbul airport attack. Passengers leave Istanbul Ataturk, Turkey's largest airport, after a suicide bomb attack Tuesday killed at least 42 people and wounded more than 230 people. 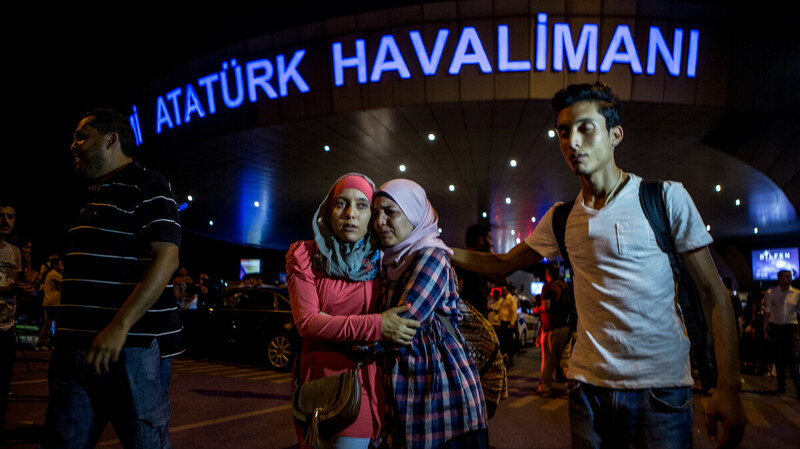 Turkish officials say Islamic State militants orchestrated the terrorist attack that killed 42 people and injured more than 230 at Istanbul's Ataturk Airport Tuesday. ISIS has not claimed responsibility. The attack at the airport was the latest and one of the most deadly in a string of at least a dozen attacks in Turkey over the past year. Turkey has blamed most of these attacks on either Kurdish separatists or ISIS. If Tuesday's attack in Istanbul is found to be orchestrated by ISIS, it could be a game-changer in the war against ISIS, Brett McGurk, special presidential envoy for the Global Coalition to Counter ISIL, tells NPR's Kelly McEvers. "Well, I think you have to remember they have been sending suicide bombers out to do attacks — it's something they've been trying to do for years — it goes back to really their earliest propaganda," McGurk says. "So they have been recruiting these jihadis, indoctrinated terrorists from all around the world, and it's important for your listeners to keep in mind, we've never seen something like this before." Forty thousand of these foreign fighters have poured into Syria over the last five years — about twice as many as that went into Afghanistan in the '80s. This is something that will be with us for many years to come, but to defeat them we have to take their territory away. We have to make it harder for them to travel, and obviously the investigation here is just underway in Istanbul, but it does appear to be an attack by ISIL and I think this is ... what they try to do. They try to basically sow fear into populations and transit centers, and it looks like that might have been what they did yesterday in Istanbul. Well, Turkey's a member of our coalition. I've probably been to Turkey, second to Iraq, in any other country really in the last 18 months or so, and you know, we've broken agreement with them about a year ago to open Incirlik Air Base, and we've been flying air missions against ISIL from Incirlik ever since then. Forty-thousand of these foreign fighters have poured into Syria over the last five years, about twice as many as that went into Afghanistan in the '80s. This is something that will be with us for many years to come, but to defeat them we have to take their territory away. We work very closely with Turkey about the protection of their border and about filtering out the foreign fighters that continue to get in and out of Turkey into Syria. They've done an awful lot. President Obama had a very long and detailed meeting with President Erdogan at the G20 meeting some months ago about the issues on their border, and since then they have really strengthened the defenses on their border. Is there more they can do? Yes, and I think in the wake of this attack we'll obviously be talking with them about how we might continue to be able to work together on this. Well again, we're in the middle of a very important operation here. We call it the Manbij gap. It's about a 98-kilometer strip of border that ISIL has controlled with Turkey for some years now and we're working now to close it up. We launched an operation, it's really a surprise attack against ISIL, about three weeks ago, across the Euphrates River. They've now enveloped the city of Manbij, that's important because Manbij is the city in which the Brussels attacks, the Paris attacks were kind of organized, and the attackers we believed came through Manbij before they went out of Syria to launch their attacks. As we are in the midst of the operation, we are collecting really a bonanza of information about their foreign fighter network, about their external operations planning arms, and that's something that will continue, and with Turkey we're working with a number of opposition groups just to the west of this area of Manbij city to push east, to kind of close off this border area in which ISIL continues to try to transit. So obviously, we have a lot of work to do here. It's a tough fight. We're actually making a lot of progress, but Turkey will be part and parcel of the success of that operation. On the threat of an ISIS attack in the U.S. ...There's different types of attacks. There's the lone wolf attacks that they inspire deranged individuals, that I think we saw, the terrible tragedy, the horrible crime most recently in Orlando. But then there's the very sophisticated attacks, such as Brussels, such as Paris, which are planned in Raqqa, which are organized in Syria and which are launched from there, their kind of phony caliphate. And it's pretty clear that what's driving so many people to join this movement is this notion of this caliphate, that it's a historic movement, that it's expanding and that's why it's important to show you're not going to have a safe haven to plan attacks abroad. And secondly, you're not an expanding movement, you're actually shrinking and shrinking rapidly, but that said, the number of foreign fighters that they have been able to indoctrinate, really over the last five years, is something that we all have to remain vigilant about over the years to come. And it's also this ideological struggle, and it's an ideological struggle that has to be waged not but us, not just by Western powers, but also by the Islamic members of our coalition, the Gulf states, Saudi Arabia, Egypt, very important because ISIL is ultimately a threat to those states as well, and they are doing a lot. That's one reason we have this global network of countries working to degrade the threat, but as I said yesterday before the Senate Foreign Relations Committee, we cannot let up our guard, we can't let up our guard this month, this year and for years to come. Well, the network that did the Brussels and Paris attacks is a very sophisticated network of planners, of bomb makers, of tacticians, that's the kind of thing that actually does take real organization and skill, and those skills are in shorter supply than you might think. So what we're trying to do is identify the networks and really unravel them. I'm going to give you an example of what we're doing now. Interpol works very closely with our coalition. If we're in the middle of an operation and forces we're working with are killing ISIL terrorists on the way, they're collecting information. They're collecting telephones. The telephones have addresses. We're able to build out the networks, who are they in contact with. This is painstaking, painstaking work, but it's underway because we want to make it much harder for these guys to operate. But that does not mean you'll be able to stop every lone wolf attack. What we want to be able to do is make it much harder to plan the sophisticated, horrific attacks such as we saw in Brussels, Paris and, it appears, Istanbul. 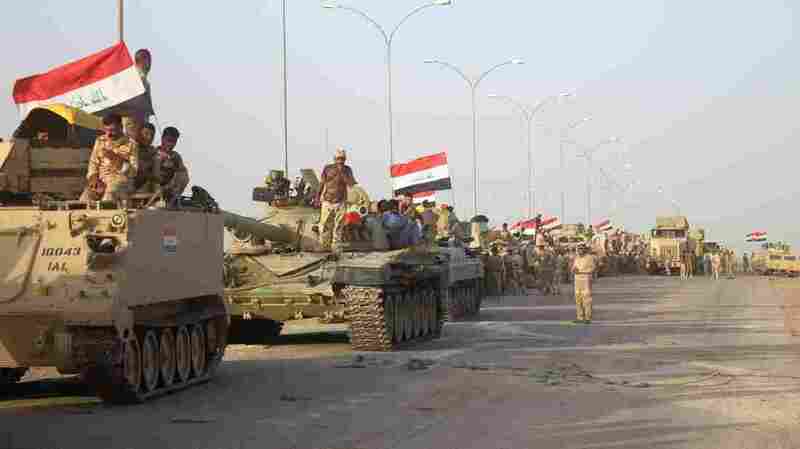 Iraqi government forces are seen near the Falahat village west of Fallujah on June 27. Iraqi forces retook the city of Fallujah from the Islamic State. Well, just to be specific, when we put this strategy together, it's a three-year campaign to degrade and ultimately defeat, but that's not as important as the actual progress on the ground. When we started this in fall of 2014, there were very few forces on the ground that could stand up to ISIL. ISIL was the dominant military power. We had to gather the intelligence; we had to train the local forces; we had to build coalitions both locally and globally to begin to push back. And since then we've taken back about half their territory in Iraq, about 20 percent in Syria, but most importantly, it's not just the land masses — it's the strategic territory. The entire border with Turkey has been taken away from them east of the Euphrates River with the exception of that 98-kilometer strip of border I mentioned. In Anbar Province now, to Crete, Fallujah, Ramadi, Hit, Haditha, Ar-Rutbah, leading to the border of our very close partner Jordan, all have been now taken away from ISIL. So next on the list certainly is Mosul and then Raqqa. That is kind of the brain and heart of ISIL. And ... we have a tempo to this campaign, then our sites will be set on Raqqa. Manbij sets the conditions for Raqqa. And as I speak at this hour, there's a number of very important maneuvers going on south of Mosul to set the conditions for Mosul. We just can't put a time frame on something as dynamic as this, and the sustainable defeat of ISIL and its phony caliphate will come from local people, and to organize the local forces to give them the capacity to be able to fight and to maneuver and to work with our coalition — that takes some time. But what you gain by building those local forces is a sustainable lasting defeat. It's more sustainable than U.S. forces going into Mosul tomorrow. We want the people of Mosul to be part and parcel to their liberation, and I was just in Iraq last week, in fact. We had very important planning meetings on Mosul. The government of Iraq has just authorized 15,000 local fighters from the area of the province of which Mosul is the capital, and we've already identified many of them. We're training them. We're getting them ready for the liberation of Mosul. So this is underway, but I can't put a time frame on it. Well, I don't want to diminish the role that our U.S. military personnel are playing in Iraq and Syria, and of course, I've been on the ground to visit them, and I've been on the ground repeatedly in Iraq to visit them. And in this operation south of Mosul I just mentioned, we have U.S. Apache helicopters [as] a part of that operation; we obviously have U.S. special forces advisers as part of that operation, so we are very much engaged in this fight. But the sustainable defeat of ISIL will come from the people who know the towns, who know the villages, who know the terrain and those are forces, those are Iraqis and those are our coalition partners we're working with in Syria. Well ultimately the Middle East is going through this broad upheaval. I mean, there's a great book called A Peace to End All Peace about the end of World War I, in which the author writes, it took about 1,500 years from the fall of the Roman Empire for western Europe to kind of settle out as we know it. And he was writing that book at the end of the last century, so we're less than 100 years out from the fall of the Ottoman Empire and kind of first principal questions of borders and identity are up for grabs, and we want to make sure that process emerges in a way that does seriously impact our own direct national security interests. I think you'll see more decentralization; we believe very strongly in the unified states of Iraq and the territorial integrity of Iraq and Syria, but we want to make sure that transnational terrorist attacks such as ISIL or Jabhat al-Nusra, which is al-Qaida's affiliate in Syria, cannot take root and cannot have safe haven. So I think the political orders here, more decentralization, something I think is inevitable, is something that obviously we're going to have to manage and this will be a process that unfolds over a period of years, but we have to define our interests very specifically, and we have to make sure we're protecting those interests, and we have to have partners in the region that we can work with to do that. Well, Kelly, so far every territory, every town, every city that has been retaken from ISIL, ISIL has not been able to come back and reclaim it. So we've managed to hold with the forces we're working with every single major area that we have retaken and that's quite significant, and there's a reason for that, and I can't guarantee you could have something happen over the next week or the next month, but that's been the trend over the last 18 months. We're getting more information every single day on ISIL. We're learning who the leaders are, we're learning who they're connected to, and then we're finding out where they are, and when we find out where they are, we target them. We're taking out about one leader now every three days. That's because every time before an operation that we support is launched, we do the hard work, the political work, who's going to govern after, who's going to hold and how will we stabilize. And within the global coalition, we have a stabilization funding mechanism, kind of a quick hit, fast project mechanism to get people back to their homes, to get life back to the streets. So in the city of Tikrit, which is an iconic Sunni city in the heart of Saladin province, the city was entirely depopulated from ISIL. When it was liberated last summer, we worked very closely with local leaders, the local actors, flooded resources into Tikrit through this stabilization funding mechanism and eventually people start to return to their homes. And then they see that the people of Tikrit are in charge of their security, that local Tikritis are the policemen in the streets. It reaches a tipping point, and now 95 percent of the people have returned have to Tikrit. In Ramadi, we're working to do the same thing. What has slowed down the returns in Ramadi, about 60,000 have returned, are these IEDs and booby traps that ISIL leaves in almost every home before they retreat from an area. So working through the coalition, we raised immediately $15 million. One of our close partners, Norway, has been a leader in this effort. We have a world-renowned company overseeing the de-mining effort in Ramadi — that's ongoing now street by street. The point I'm trying to make: this is a painstaking, very difficult, very complex, very dynamic effort, but it's not just the military. We have to be thinking about what comes next, and before we cooperate with local forces on the ground, we think all of that through. Well, the reason Manbij is so important is because Manbij cuts off the ability of these terrorists to travel from Raqqa and out of Syria into Turkey and into Europe or anywhere else. What we're doing before we move into Raqqa proper is isolating Raqqa entirely. We've cut off all the roadways between Raqqa and Mosul, and we're now in the process of cutting off all of the access from the Turkey border into Raqqa, and so that is very much ongoing. So in the meantime, there are terrorists in Raqqa who are planning external attacks. We're trying to find them, and when we do find them, we target them, but that can be difficult, too. I'll give you an example: the terrorist Jihadi John, who's known for attacking American hostages, his main job for ISIL — he was a computer hacker. He was sitting in his apartment building all day trying to inspire attacks here in the United States and elsewhere. We eventually identified him, but he was living in his apartment building with hundreds of people, and it's a very difficult question, what do you do in that circumstance? He never came out of the apartment building. He eventually did come out, and we targeted him with real precision, and obviously, eliminated that threat. So this is what our intelligence professionals are doing every single day. We're getting more information every single day on ISIL. We're learning who the leaders are, we're learning who they're connected to, and then we're finding out where they are, and when we find out where they are, we target them. We're taking out about one leader now every three days.